Recent Keurig 2.0 w/DRM Demo – get ready for more expensive K-Cups! Update to previous post: The new Keurig 2.0 with DRM was recently demonstrated, and as Techdirt reported a few weeks ago, the incorporation of pods with Digital Rights Management (DRM) has nothing to do with safety. Rather, it’s about eliminating competition. 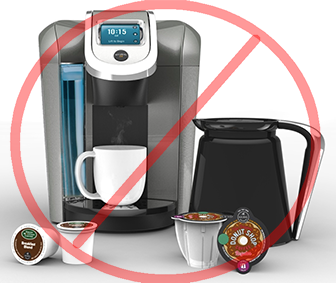 Oh, and by the way, this new Keurig model WILL NOT work with previous model K-cup pods (according to Techdirt). A report from Credit Suisse published this month found that sales of private-label cups grew by 203 percent over the last year, while Keurig’s Green Mountain cups grew by only 12 percent. This is a particularly threatening form of counterfeiting for Keurig. Like printer companies with their inkjet cartridges, Keurig’s business model is built on selling machines cheap and then reaping huge profits on the refills. Now, bereft of a legal monopoly on pod making, Keurig is trying to establish a technological one: its new brewer, which goes on sale this fall, has a mechanism that scans each pod for Keurig’s markings and locks out any unapproved capsules. It’s essentially digital rights management (DRM) — a mainstay in music and video — adapted for coffee. So, there you have it. The ‘Keurig Green Mountain‘ monopoly just wants to suppress any competition, or as a minimum (should it choose to license it’s coffee pod DRM technology), it just wants to ensure that the competition cannot undersell it’s own coffee pods. Aren’t monopolies just simply wonderful! What can we do??? Say NO to DRM — in everything you purchase! There’s plenty of competition for K-Cup brewers, many cheaper in price, and many that are of much higher quality. As for third-party, non-DRM coffee pods? I’ve almost always found them as good or better, at a much more reasonable price. The “free market” is all about competition & innovation. Almost all monopolies, including Keurig Green Mountain, are all about suppressing competition & innovation. Do the right thing & don’t let them succeed! This entry was posted on August 3, 2014, 13:25 and is filed under DRM. You can follow any responses to this entry through RSS 2.0. Both comments and pings are currently closed.